Considering the spectacular Peigutso Lake, the 185 km drive from Saga to Paryang was tedious. We made a bee-line to the western edge of the Tibetan Plateau, which remained featureless; the skies were overcast and in the distant south we discerned the grey-brown outlines of the Himalayas. The road continued to be desolate; we didn’t even pass any settlements along the way. Just us and a long dirt road. They were badly rutted and often, the roads were cut by streamlets creating dangerous ditches. The ride was extremely bumpy and we were constantly jostled. We longed for stepping out to stretch our bodies, but the biting cold and relentless winds were ever present; forcing us to dart back to the refuge of the van. Thus even simply riding was torturous and everyone appeared fatigued and listless in their interactions. We were eager to get to Paryang, our last stop before Lake Manasarovar. We stopped at a tiny ashram in the middle of nowhere. Our outdoor restroom facilities were even more challenging, considering packs of wild dogs roamed the wilderness and came close to attacking some of our group. From Saga, we generally followed the river Brahmaputra west towards its source in Lake Manasarovar. According to legend, Brahma (of the Hindu Trinity of Brahma, Vishnu and Shiva) initiated creation of all life at Lake Manasarovar. 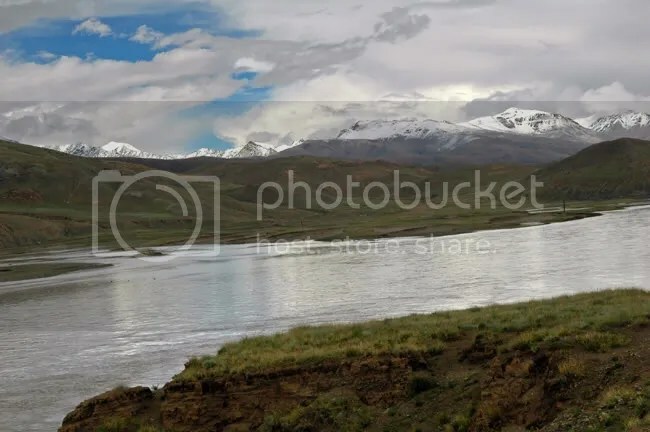 One of the streams exiting Manasarovar goes on to form the mighty river, it’s called the Brahmaputra (Brahma’s son) river – the only Indian river with a male name. Lake Manasarovar itself is fed by melting snow and run-off from many mountains in the area (including mount Kailash). Water running off mountains ringing the plateau, crisscross it in a network of streams. At places these appear as tiny streams cutting across our roads, or flowing in ditches. In other places, many such streams had merged forming larger, rapidly moving streams, and eventually forming the distinct river Brahmaputra, much further east of Manasarovar. 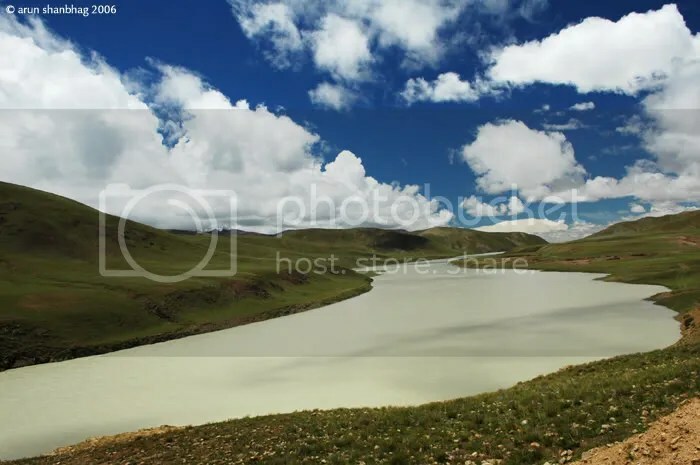 It is called the Tsang-po in Tibet and is its primary river, flowing east from Manasarovar the entire length of the Tibetan Plateau. At an average elevation of 15,000 ft, it is also the highest river in the world. Nearer to Lhasa, the roaring Tsang-po dips south cutting a deep gorge through the Himalayan range, which remains uncharted to this day. It then doubles back west again through Arunachal Pradesh, Assam and downwards to Bangladesh. Here it meets with the Ganga and deposits into the Bay of Bengal through one of the largest Ganga-Brahmaputra delta regions. See satellite-based image of the Brahmaputra valley in India. At Saga it is a broad, quiet river. Till last year the jeeps had to be ferried across the river taking a few hours, but with a newly built bridge we don’t even pause and zip by. As we drive west towards Manasarovar, we are generally following the river upstream, even though we do not see it again. But the entire time we know the river is close by and we are riding to its source; and as legend would have it – the source of all creation on earth. I have still not finished reading your encounter with the unknown, mystic and wonderful land. I’m planning for a trip in May 2011. Your experience is definitely giving me important tips about the journey. It would definitely help my mental preparation as to what I could expect and experience. It is a great reading. Thanks for sharing your experiences with lots of prospective travellers like us. Wishing you the very best in your Yatra in 2011 and you are right ~ it is mainly mental. ultimately, you have to surrender and just ‘go.’ Its “HIS” job to worry. Best Wishes for your Yatra.